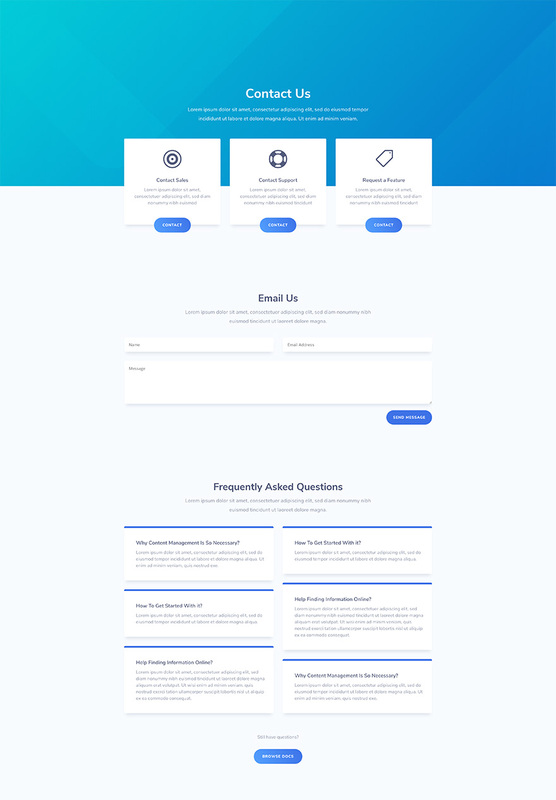 This week Kenny and his team have created a results-oriented and stunning SaaS Layout Pack with seven different pages that will help your visitors find exactly what they’re looking for. 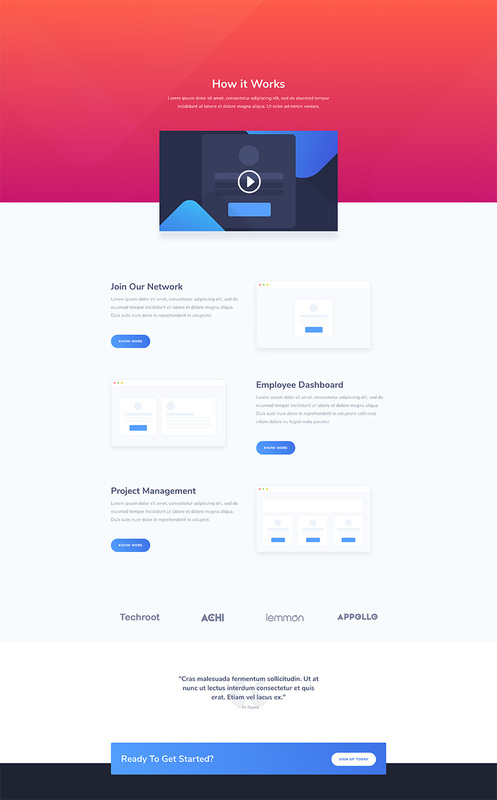 This SaaS layout pack is designed to get your SaaS website up and running in no time. 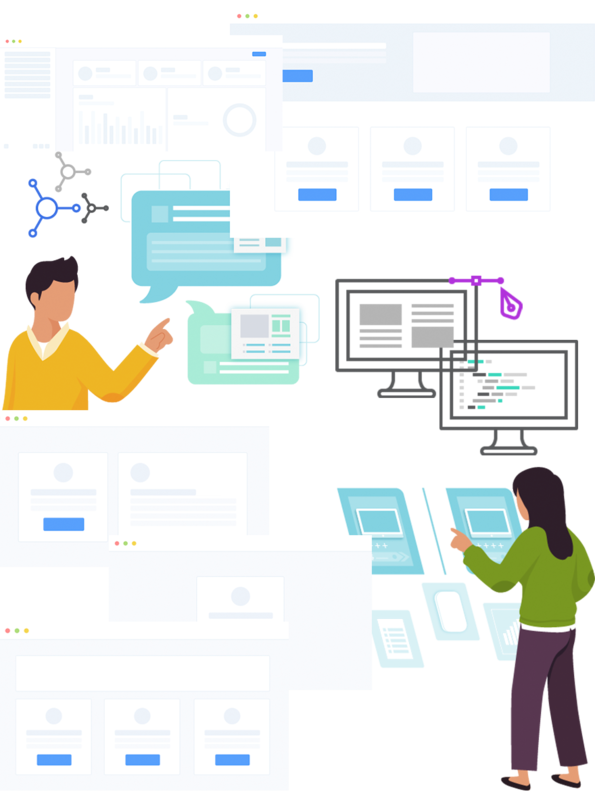 With seven stunning and elaborated layouts, your website will contain all the pages it needs with the necessary information which you can adjust to your own needs. A professional approach is the primary focus of this layout pack and matches perfectly with the stunning illustrations and advanced built-in Divi options that were used to bring you a completed and easy-to-install layout pack. 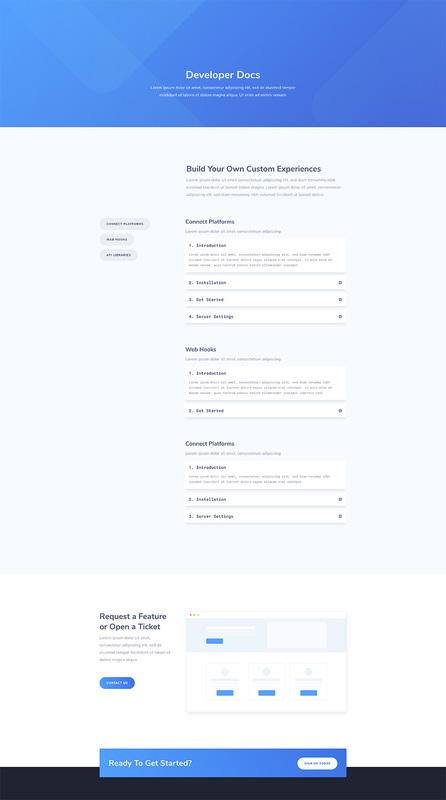 On top of that, the layout pack includes, among other layouts, a documentation page that’ll allow you to share your documentation in an elegant and targeted way. To use the SaaS Layout Pack on your own Divi website, you will first need to download it using the button below. To gain access to the download you will need to subscribe to our Divi Daily email list by using the form below. As a new subscriber you will receive even more Divi goodness and a free Divi Layout pack every Monday! If you’re already on the list, simply enter your email address below and click download. You will not be “resubscribed” or receive extra emails. Once you have downloaded the layout pack, locate the divi-saas-layout-pack.zip file in your downloads folder on your computer. Double click the folder to unzip it and then navigate inside the divi-saas-layout-pack folder. Inside this folder you will find 7 files, each of which is a unique layout that you can import into your Divi Library. To do so, navigate in your WordPress Admin to Divi > Divi Library > Import & Export. You can select the individual layout you desire or choose the All Layouts file to important everything at once. To load one of these layouts onto your page, activate the Divi Builder and then look for the “Load From Library” icon in the page settings bar (it looks like a plus symbol). Click this icon to launch the Load From Library popup and then navigate to the Add From Library tab. Here you can choose any of the seven layouts we’ve included in this pack to add to your page. 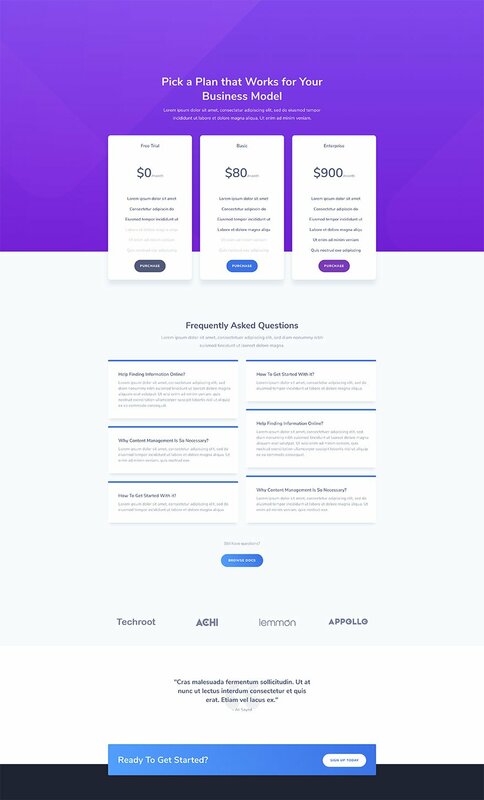 We hope you enjoy this SaaS layout pack. And to help ensure that you do, we’ll be doing a live stream on our Facebook page this Wednesday at 3pm EST to walk through what it might be like to actually use this layout for your own website instead of simply importing it and loading it up. We’ll talk header and footer design, customizer settings, converting certain sections to global, and more. Why the Download file is labeled Restaurant Layout? That is what happens after you party too much on New Years eve. I partied al night and when I downloaded it I got some alternative herbal medicinal layout for hangovers. Whoops, I guess that’s what happens when you try to work during vacation! It’s fixed now. Restaurant layout pack is what’s being downloaded, guys! Happy New year to you and the team Nick. All the best for 2018! As others have mentioned already, the download link is to the divi restaurant layout pack. In addition to that, all the demo links link to the same page; the normal divi preview. The links are bad – both the layout and the photo assets links go to the restaurant layout and not this Saas one. Sorry about that Sharon, it’s fixed now! Thank you Nathan, and Happy New Year! I may be missing something, but the download is named “divi-restaurant-layout-pack.zip” and the images zip is “divi-restaurant-layout-pack-images.zip” and the images are of food? I know you are giving these layouts for free, but it is kind of repeat of the same one over and over. NO creativity with the last few. I would highly recommend that you make new ones with tips and tricks in theme not just the same layout and the same style and theme. Remember, you are the best! You guys are very smart and you offer value beyond my imagination but if you want to give us something don’t destroy your brand in the process and cheapen your value. I hope you take my comments to heart and know that I am just giving you constructive criticism. Always think how do I feel when I get you free stuff, is it aaahhhhh or just another useless free stuff just to meet the Monday deadline!!! The first few weeks, I used to wait for you email and get excited when I see the email, now, NOT so much. Please listen to our pain. Dig deeper. It does not have to be about the Your Theme alone. Think Integration, solutions, WooCommerce Styling Pain, them SAAS integration styling, etc… You can do it. I know you can. Thank you, you took the words right out of my mouth. It’s a shame but now they have me looking at other Page Builders 🙁 COME ON GUYS, YOU ARE BETTER THAN THIS!!! It’s not OUR pain. Is just YOUR pain. For me they are doing a great work every week! I think in most of these layouts, there are at least 1 or 2 new elements that you can use easily for other sites. Here, I like the call to action at the bottom of the pages and I could imagine using this element on other sites. What you are asking for is all great stuff, but actually way beyond what a Divi layout pack truly is. These layout packs are built to work with Divi out of the box and meant to be a framework for adding your own integrations, solutions, and custom styling. Although, they can be used at face value, it is also highly encouraged that people use these as a launch off point. Hi – First, thank you for everything you guys do. The resources and education here in the DIVI community is second to none. Seems like you have a great team there! Looks like the links to the SaaS layout and images point to the restaurant pack. Donjete, you’re an angel love, thank you for this! ET makes us awesome..
How do you recreate the blurbs with the rounded corners and color at top? This looks great! Perfect for refreshing my website. Thank you! WoW! The perfect layout I was searching for my business. Thanks a lot guys. While nice, it’s a shame the layout loses the color of the fancy backgrounds (like in the header) in IE and Edge. They might not have the largest user base, but they are still important in businesses. You should, IMO, either include a work-around so the layouts work correctly in all browsers, or only use features that gracefully downgrade. “Software as a Service”. It’s just a type of website like “restaurant” or “boutique”. thanks for the continuous contributions. I’ve been importing the All json into the Divi library and it is taking a very long time, it seems. Over 20 minutes so far, and it’s just 75% completed. We’re hosting on WPEngine with plenty of HD space, so I’m not presuming it’s a hosting issue. It this kind of importing time normal? It’s now been stuck at 75% and 1 min estimate remaining time for an hour now. FWIW, I cancelled the import and tried again. This time, it worked within a few minutes.